The Waterfront District is the new Beirut destination. Commanding spectacular views to the sea and to mountains snowcapped through winter and spring, the 73 ha of reclaimed land, enclosed by a terraced sea defense system able to withstand centennial storms, are designed as a natural continuation of the traditional city center. Some 29 ha of development land will offer 1.7 million sq m BUA to form a prime, active, multiuse district with distinctive architecture. The development density will be higher than in the traditional city center, with nearly 60 percent of the reclaimed land set aside for public spaces. These consist of a waterside city park, sea corniche, quayside and sea promenades, squares and gardens, plus walking, jogging and cycling trails. Marinas, waterside leisure, lifestyle, cultural and other entertainment are among visitors’ attractions. Beirut Marina quays and the 1.3 km-long sea corniche and promenades, varying in width from 45 to 110 m, have become a popular pedestrian area. Upon completion of the Eastern Marina, the city center will offer a 3.5 km uninterrupted extension of the Beirut shoreline, providing more than four times the space of seafront promenade currently available in the city. Solidere aims to develop the Waterfront District as a model of urban development. Destined to become a major destination, the district is already hosting several temporary cultural and leisure activities, as per Beirut Exhibition Center (BEC), a biking and walking trail that leads from the traditional city center to the waterfront promenade, and is planning a number of other cultural and leisure activities along a pedestrian spine. 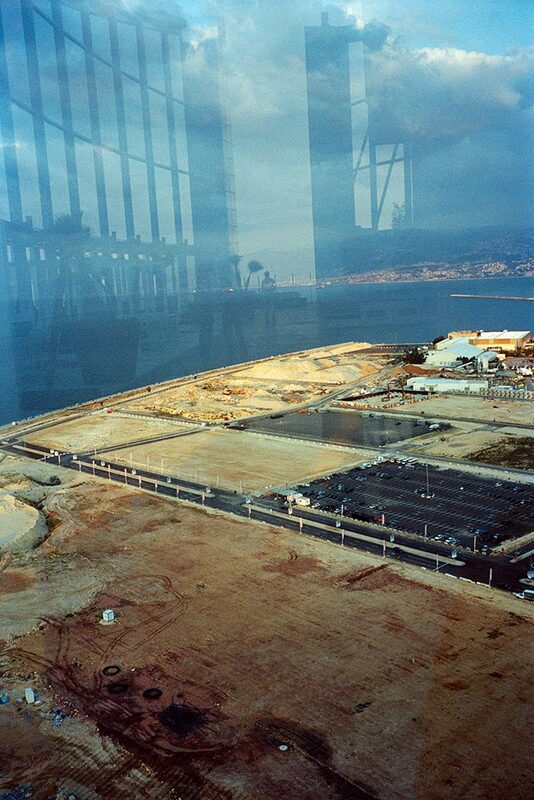 Phase One of the Beirut city center Master Plan (1994 – 2004) saw the completion of marine works, defense structures and sea promenades, the finalization of Beirut Marina, and major advances in landfill treatment and land reclamation. US firms including Skidmore Owings & Merrill (SOM) for urban design, Sasaki for landscaping and Parsons Brinckerhoff for transport planning. Phase Two of the Master Plan (2005 – 2030) has seen the completion of land reclamation and involves finalizing and implementing the district landscaping design and infrastructure. It also includes initiating real estate projects and developing the Eastern Marina. The Waterfront District infrastructure, including the road network, is planned for completion by 2014. The detailed design of the Eastern Marina, by Cowi (Denmark), has been completed and approved by CDR. All the structure details were verified by a 3D model test to meet international standard wave and stability criteria. Construction is planned for completion by end 2014. Chris Blandford Associates (UK) were the winners of a limited competition launched in 2010 to design the landscaped features of all infrastructure and roads, including sidewalks, shared surface and pedestrian streets, medians and traffic islands, streetscape, street furniture, lighting, trees, etc. The landscape concept for the sea corniche promenade is in progress. A natural continuation and termination of the existing Beirut Corniche, the promenade is also the largest street in the Waterfront District, with the strongest relationship to the coast. It will have a great sense of openness and freshness, facing north to the sea with views of the coast and Mount Sannine to the east. A significant green medium will add to its local identity. The 400-space under corniche car park was opened to the general public in January 2012. The landscape scheme accommodates such car park surface elements as: access via an external staircase and lift from the corniche pavement; planting details; emergency access routes from underground stairwells; and approaches to planting and hard surface at the car park entrance to maintain visibility. Landscape design is being finalized for the Beirut Marina breakwater parking area, boardwalk and quays. The leading element in creating a significant public domain within the Waterfront District, the 78,000 sq m waterside city park will also be the largest public green area in Beirut. It was the subject of a design competition among six of the world’s leading landscape architectural firms: Land (Italy), Martha Schwartz Partners (US/UK), Olin Studio (US), Sasaki (US), West 8 (Netherlands) and Wirtz (Belgium). The concepts are under study and a winning design will be announced in the future. The Waterfront District has elicited strong investor interest. Several plots of land, developed by Solidere or sold to private investors, are or will be designed by international and local architects. Adjacent to Beirut Marina, Zaitunay Bay, owned by Beirut Waterfront Development s.a.l., a 50/50 joint venture between Solidere and Stow Waterfront Development, is conceived as an urban beach extending the Beirut Corniche by a series of overlapping platforms reminiscent of sea waves, to provide outdoor spaces and public areas for artwork. On the northeast is the apartment and yacht club building, expected to be inaugurated in September 2012. Its 14,000 sq m of floor space over four stories and three basements accommodate 53 serviced and furnished apartments plus a yacht club on upper levels, with commercial space on ground level. The Eastern Marina Development is an anchor project of the Waterfront District. The site, a prime location, has its north, south and west sides overlooking the Eastern Marina, with the south side also overlooking the Beirut Port First Basin. The development will incorporate a private luxury and contemporary urban Beach Resort. It will accommodate a resort hotel, plus a residential component comprising serviced condominiums and low-rise residences, cabanas and bungalows, with quayside retail, with views of the traditional city center, the sea and the mountains. It will benefit from landscaped private open space as well as public pedestrian and vehicular access to the marina quay along and parallel to the Ottoman Wall Walk, and be serviced by an underground car park. The architect assigned to the Beach Resort will provide guidelines for the respectively residential condos, commercial and retail components. This landmark project, serving the government, business, cultural and tourism sectors, is to feature a multi-functional auditorium accommodating a variety of local and international events: conferences, exhibitions, concerts and theatre performances. It will be surrounded by public spaces: a square to the north; a linear park to the south, extending from the city waterside park to the Eastern Marina; a sequence of green spaces from Khan Antoun Bey Square to the sea corniche promenade. Ten lots have been sold to third parties on the waterfront. Among them, Mika Land Development, on lot 1493 Marfaa, is under design by Foster + Partners (UK) and R & K Consultants to offer 32,000 sq m of residential space. The project is a mixed use combining retail, offices, residential and entertainment areas. The architect aims to design a green intelligent building, using the most environmental friendly techniques. Pending infrastructure installation and real estate construction, a variety of cultural, recreational and lifestyle activities have already established the Waterfront District as a destination, with several temporary projects serving to test various land use concepts. Temporary exhibition halls, conference areas, a banquet pavilion and seaside restaurant were earlier built on the northeastern area leased to BIEL until 2013. Accessed from the existing city center, dedicated tracks pedestrian streets and terraced waterfront promenades allow public walking, jogging, cycling, kiting and similar activities. Structures and open spaces with a wide-ranging program of activities are providing cultural, recreational and commercial attractions. Several plots are concert venues drawing international performers and musicians. and designed by Makram El-Kadi and Ziad Jamaleddine from L.E.FT., the prefabricated structure was reconfigured on the interior, and given a contemporary customized skin of corrugated anodized mirror aluminum. The mirror façades allow the BEC to act as a scale reflecting the continuously changing landscape in the Waterfront District. A joint venture between Sky Management and Solidere, is a state-of-the-art winter sky bar to be inaugurated by end 2012 on the 3,200 sq m block 151-01. Designed by Sari El Khazen, it will stand out as a giant graffiti canvas. Lebanese and international artists will be invited to narrate Beirut’s story on the building façade, set to become a work of art. A joint venture between Solidere, Kaztel & Kazma Trading and Kzone Outdoor Advertising Group, the project, extending over 3,000 sq m, is to offer a theme park for children, where they can play and learn about the world by role-playing in different jobs that make up the sectors of a real city. The project is expected to open by end 2012.